On Alfred Hichcock Presents (1960). During his role as Chester on Gunsmoke, Weaver appeared on The Twilight Zone and in Orson Welles' Touch of Evil with Charlten Heston. 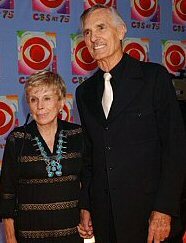 With wife of 60+ years, Gerry, at CBS's 75 year celebration in 2003 (AP). In Gentle Ben. Clint Howard (left) is Ron Howard's brother. Weaver introduced thie parents. "Because of Dennis, Ron and I exist. … Dennis was a great guy," said Clint Howard after Weaver's death. 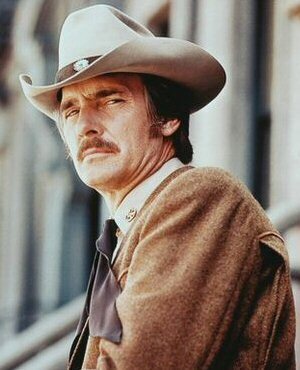 Dennis Weaver who played stiff-legged Chester on "Gunsmoke" and the cowboy cop hero in "McCloud," has died. He was 81. A struggling actor in Hollywood in 1955, Weaver was earning $60 a week delivering flowers when he was offered $300 a week for a role in a new CBS television series, "Gunsmoke." He learned that another actor had turned down the same role at $400 a week. Weaver summoned his courage and asked for and got $400. By the end of his nine years with "Gunsmoke," he was earning $9,000 a week. After working with Jack Webb in his Dragnet film (and later in the first incarnation of the TV series), Weaver was called by Charles Marquis Warren (director of Seven Angry Men and television's Gunsmoke director) to audition for the role of Chester Goode, assistant to Dodge City marshal Matt Dillon in Gunsmoke. When he learned that his potential co-star was 6' 7" James Arness, Weaver knew he had to come up with something to help him stand out. He devised an awkward limp and unusual way of speaking for the character. 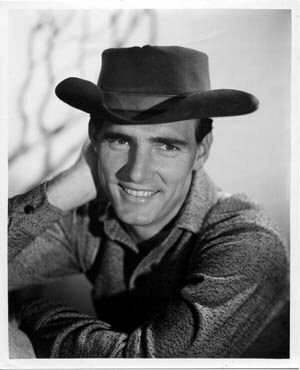 Chester's popularity helped to propel Gunsmoke into the ratings stratosphere, and as the series ran for some 20 years, during which time, Weaver would won an Emmy (1959). He also participated as part of a singing trio with cast-mates Milburn Stone (Doc Adams) and Amanda Blake (Miss Kitty). When Weaver first auditioned for the series, he found the character of Chester "inane." He wrote in his 2001 autobiography, "All the World's a Stage," that he said to himself: "With all my Actors Studio training, I'll correct this character by using my own experiences and drawing from myself." The result was a well-rounded character that appealed to audiences, especially with his drawling, "Mis-ter Dil-lon." The role brought him an Emmy in the 1958-59 season. In the 1950s, Weaver also toured in a singing trio with the series' Miss Kitty (Amanda Blake) and Doc (Milburn Stone). "He was a wonderful man and a fine actor, and we will all miss him," said Burt Reynolds, who appeared with Weaver in "Gunsmoke" in the early 1960s. 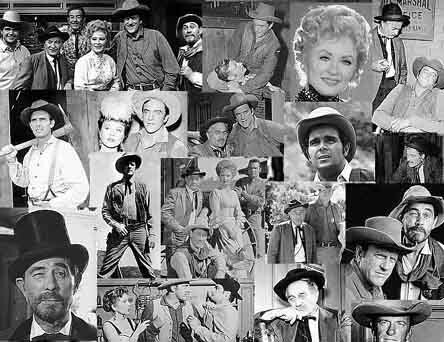 Gunsmoke' began airing as a 30-minute segment, Arness said, so the actors only worked for three days. The remainder of the week, he and Weaver traveled across the country making personal appearances. The last time the two worked together was in September 2005 when they taped a documentary marking the 50th anniversary of "Gunsmoke'' for distribution on DVDs. Weaver was "a very, very skilled actor. He played the country character Chester but he was trained on the New York stage,'' Arness said. In 1966, CBS starred Weaver and a 600-pound American black bear in "Gentle Ben," about a family that adopts a bear as a pet. The series was well-received, but after two seasons the network decided it needed more adult entertainment, and "Gentle Ben" was canceled. Next came the character Sam McCloud, which Weaver called "the most satisfying role of my career." The "McCloud" series juxtaposed a no-nonsense lawman from Taos, N.M., onto the crime-ridden streets of New York City. His wild-west tactics, such as riding his horse through Manhattan traffic, drove local policemen crazy, but he always solved the case. Rotating on Sunday nights with "Columbo" and "McMillan and Wife," "McCloud" lasted from 1970 to 1977. A vegetarian for most of his adult life, Weaver became an activist for protecting the environment and combating world hunger. He served as president of Love Is Feeding Everyone (LIFE), which fed 150,000 needy people a week in Los Angeles County. He founded the Institute of Ecolonomics, which sought solutions to economic and environmental problems. He spoke at the United Nations, U.S. Congress, to college students and school children about fighting pollution and starvation. "Earthship" was the most visible of Weaver's crusades. He and his wife Gerry built a solar-powered Colorado home out of recycled tires and cans. The three-foot-thick walls helped keep the inside temperature even year around. "When the garbage man comes," quipped Jay Leno, "how does he know where the garbage begins and the house ends?" The 10,000 square-foot home was put up for sale for $3.8 million before Weaver died, according to the actor's Web site. A spokesman for Alpine Lodging & Real Estate of Telluride, confirmed Monday it was still for sale. Weaver countered: "If we get into the mindset of saving rather than wasting and utilizing other materials, we can save the Earth." In 2003, he starred in a documentary of his ``Drive to Survive,'' a caravan of alternative-fueled vehicles that traveled from Santa Monica, California, to Washington, D.C. The trip was to promote his nonprofit Institute of Ecolonomics, a word Weaver made up by combining ecology and economics. 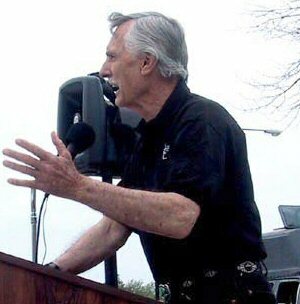 He and his wife Gerry founded the organization in 1993 to save the planet from pollution. He also joined singer Willie Nelson to promote farmer-grown biodiesel as an alternative fuel. The tall, slender Weaver came by his Midwestern twang naturally. He was born June 4, 1924, in Joplin, Mo., where he excelled in high school drama and athletics. After Navy service in World War II, he enrolled at the University of Oklahoma, and he qualified for the Olympic decathlon. He studied at the Actors Studio in New York and appeared in "A Streetcar Named Desire" opposite Shelley Winters and toured in "Come Back, Little Sheba" with Shirley Booth. Universal Studio signed Weaver to a contract in 1952 but found little work for him. He freelanced in features and television until he landed "Gunsmoke." 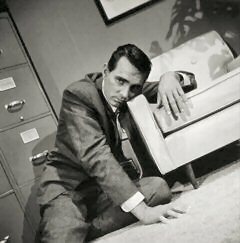 Among his movies: "Touch of Evil," "Ten Wanted Men," "Gentle Giant," "Seven Angry Men," "Dragnet," "Way ... Way Out" and "The Bridges at Toko-Ri." 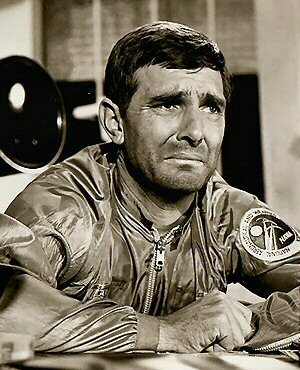 Weaver appeared in dozens of TV movies, the most notable being the 1971 "Duel." It was a bravura performance for both fledgling director Steven Spielberg and Weaver, who played a driver menaced by a large truck that followed him down a mountain road. The film was released in theaters in 1983, after Spielberg had become director of huge moneymakers. 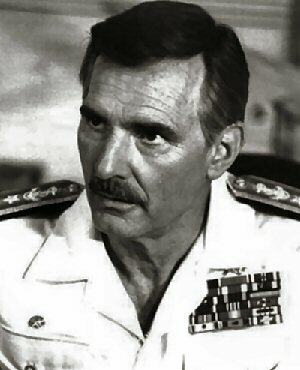 Weaver's other TV series: "Kentucky Jones," "Emerald Point N.A.S.," "Stone" and "Buck James." Weaver starred in 2005 in ABC Family's "Wildfire" as the eccentric owner of a thoroughbred racing ranch. From 1973 to 1975, he served as president of the Screen Actors Guild. He succeeded the late actor John Wayne as spokesman for Great Western Bank for 14 years and hosted Starz Entertainment's ``Westerns'' channel for the past nine years. During his career, Weaver, who was given a star on Hollywood Boulevard's Wall of Fame in 1986, received the Screen Actors Guild Award, Publicists Guild Award, 2002 Cowboy Spirit Award, Festival of the West Award, Western Heritage Award and Hollywood Women's Press Club Humanitarian Award, among others. He also has a star on the Dodge City (KS) Trail of Fame. In 1981, he was inducted into the Western Performers Hall of Fame at the National Cowboy & Western Heritage Museum in Oklahoma City, Oklahoma. Attending Weaver's memorial service were James Arness, Ed Asner, Valerie Harper, and Glenn Strange’s niece, Julie. Dennis’s wife, Gerry Weaver gave a tribute to her husband. Weaver is survived by his wife of 60 years, Gerry Stowell; three sons, Rick, who was the producer of Magnum P.I. 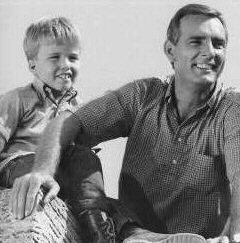 ; Robby, who acted in "The Greatest American Hero;'' and Rusty who was a musician with the Rockodiles; and three grandchildren.